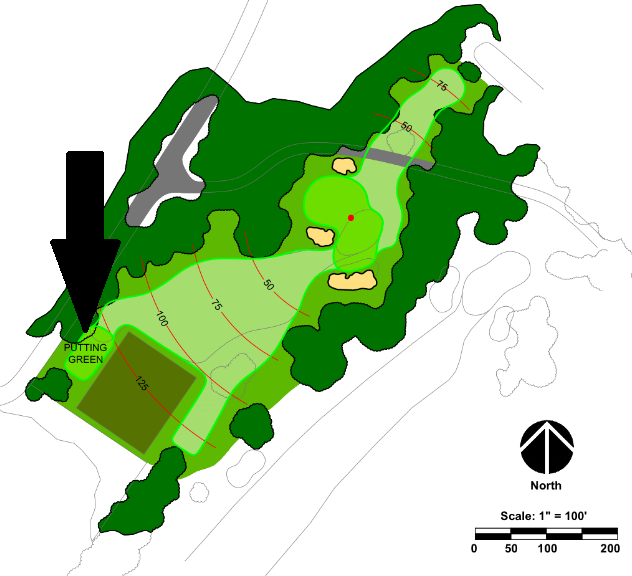 In the image above, you're looking at the renovation proposal for the practice hole. Our architect Nick Schaan from DMK has come up with this concept and I think it's brilliant, but of course what else would you expect from Nick. We tasked Mr. Schaan with devising a plan that would give us a practice area which can be utilized by more than one person at a time, and obviously an area that represents what you might find out on the links at Tacoma. So this is the plan that the Committee supports and we will be looking to get it approved by the Board so that we may begin construction this fall. If your interested, continue reading as I break down the details of the plan. First, look closely at the green itself and you'll see that it is 3 times larger than the current one. Also, it's plain to see that there are three bunkers instead of just the one. 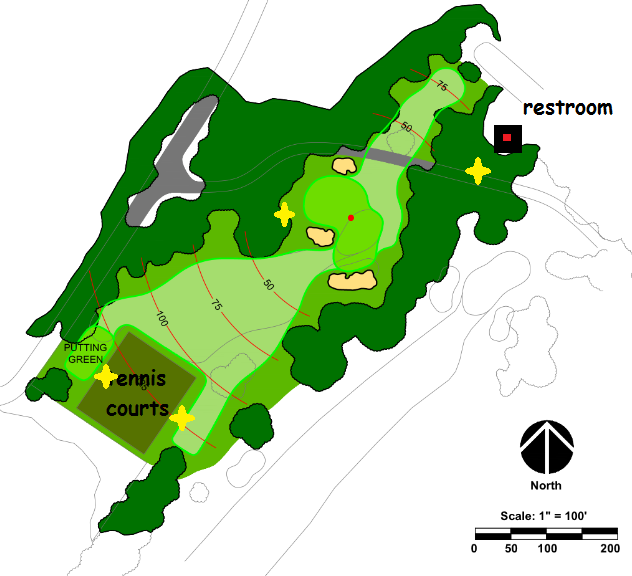 You should also notice that there is a new fairway area south of the tennis courts (area B). From here you can practice shots up to 130 yards where as now from area A the maximum is about 120 yards. Area C, north of the green, is the perfect place to practice that long bump and run shot since you wouldn't have to carry a bunker. If you've been on the course lately, you can see that the long bump and run is a shot you must have in the bag if you hope to score well. With the new fairway areas, expanded green, and bunkers, it wouldn't be a problem for two or three people to use the facility simultaneously. This is something that really isn't practical with the current practice area. In the southwest corner, you can see that there is a new putting surface. The idea here is make this surface dead flat. Of course you can practice putting, but the idea here is to provide a surface with multiple uses. Our thought is you might take up a game of Bocce ball or croquet. Or maybe you just throw down a blanket and have a picnic, or whatever one does when they're bored of playing tennis and hitting wedges. Now this image shows where trees would be removed in order to make the plan work. 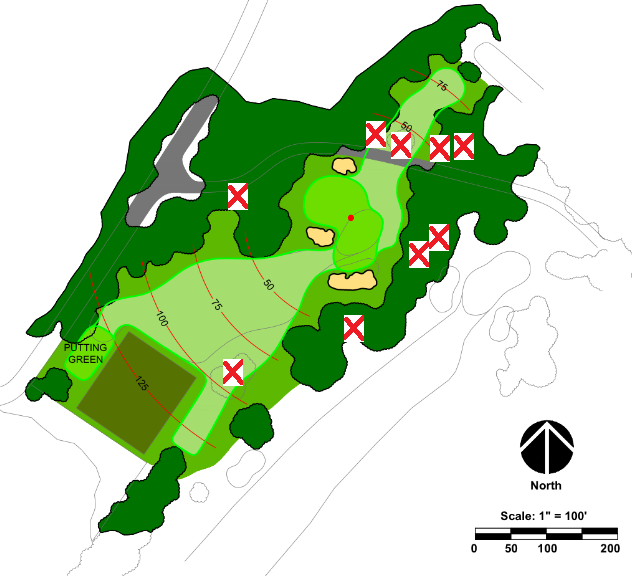 Currently there is 9 trees that we have identified that should be removed. 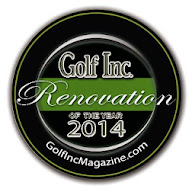 Some removals are to accommodate golf and some are to allow sunlight penetration. Either way, this is a heavily wooded site and it is unlikely that you would notice any of these trees missing. In addition, the Committee is recommending that we install some lights on the new practice hole. The diagram above shows four locations of light fixtures. There is several needs being met here. One is that this northwest corner of the property currently has no power or lighting. This makes it very vulnerable to mischievousness activity. Also, since the restroom has no power, it has no lights and heat which means it has to be closed down during cold stretches to prevent the pipes from bursting, not to mention the seat of throne gets ice cold and none of us like that. The current tennis facility has no lighting so this part of the project would give us an opportunity to provide that, making it possible for folks to play tennis after sunset. And of course the idea is that we would also have lighting for the practice hole itself. Now these lights, and the tennis court lights would be "on demand" meaning they would be only on when you are using those facilities. The lights at the restroom would be on at all times for security and one light would be on at the green at all times simply because it would look really neat when you drive in and out of the Club. So yes, we're talking about quite a bit more than just renovating a bunker, we're talking about finishing what we started on the golf course. We just finished updating much of the course, and making it first class. The practice hole is just an abandoned par 3 from the original layout, and nothing has been done to it for several decades. It's in desperate need of some updating, and if it is to be part of Tacoma's practice area, it needs this project in order to be worthy of being in the same class as the rest of the Club. After all, the practice hole is the first thing you see when you arrive and the last thing you see when you leave, it should be "first class".